What do films such as The Breakfast Club, Dead Poet’s Society, and Freedom Writers have to teach us about American culture? 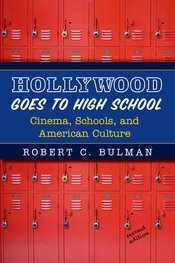 Robert Bulman’s Hollywood Goes to High School takes the reader on a fascinating journey through the high school film genre. Skillfully blending sociological theory and film analysis, Bulman’s always accessible writing delightfully challenges the reader to think critically about American individualism and class inequality. Bulman’s insightful sociological analysis of 177 new and classic high school films explores the complex ways in which Americans make sense of social class, education, gender and adolescence. Suitable for the beginning and advanced student, Hollywood Goes to High School is an essential piece of reading for a variety of courses in sociology, education, communication, anthropology, American studies, and film studies. For more from Robert Bulman read his analysis of McFarland USA starring Kevin Costner on Sociological Cinema here: http://www.thesociologicalcinema.com/blog/is-kevin-costners-mcfarland-usa-a-white-savior-film-well-yes-and-no.